Machfeld (aka Sabine Maier & Michael Mastrototaro) asked me to collaborate to this project. Similar to a biological virus the art project will mutate during the process. In this regard, one can see the result of this video projection and net installation as mutation examples. From 13th October to 2nd November 2005 the results were presented on Machfeld project server as well as in the medien.KUNSTLABOR, Graz. I created for online and "physical" exhibition two software pieces built with Processing (see below), both pieces visualize data extracted (and analysed) from a huge amount of emails recived on a normal mailbox. The visualization approach was unformal and not scientific on purpose. MAILBOX: clusters of VIrus and SPam are visualized as cubes displaying identify code, VISP type, the date of first detection and mail subject as a kind of grey scale barecode. One characteristic of medien.KUNSTLABOR is that it keeps artists server ,like an exhibition itself, in a grid of cells made of steal and glass. MAILBOX should reflect this genius loci too. IMAP Gallery - The virtually generated accumulation of unpopular spam and computer viruses serve as row material for the artistic output [...] . IVI (Interactive Virus Installation) - [...] the medium video will be extended by the support of image recognition [...]. Substrate of the emotional level is the visual rapresentation of viruses [...]. Actually my favorite one: the text "I LOVE YOU" (built with special jelly) were colonized by two different kind of bacteria. Concept and artistic direction by Sabine Maier & Michael Mastrototaro. 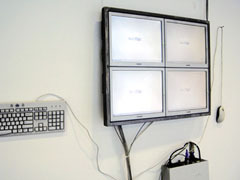 IVI programming by Hubert Hausegger. Database & Evalutation by Markus Reisenhofen. Very special thanks to Franz Xaver. note: : ,, and Graz Kunstahaus and medien.Kunstlabor during VISP exhibition. and  GROW installation. , and  MAILBOX/NANO installation. IVI still frame. IVI close up. IMAP.